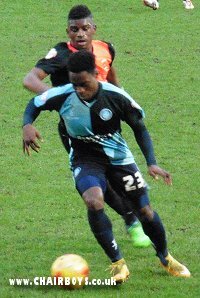 Fred Onyedinma scored his third goal in as many games as Wanderers salavaged a 1-1 draw at snow covered Bury. The match had been in doubt right up to an hour before kick-off due to the combination of snow and muddy conditions at Gigg Lane. 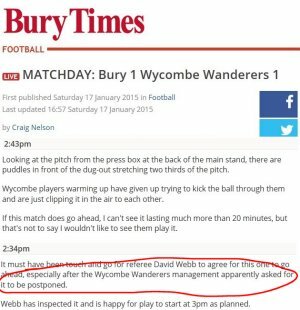 A live report on the online version of the Bury Times even claimed that Wanderers officials had asked the referee to call the game off. Reporter Craig Nelson also said he couldn't see the game lasting more than 20 minutes if it went ahead. But the game did go ahead and saw a Wanderers side with one change to the starting XI that had beaten York City the previous week - Matt Bloomfield returning to midfield in place of the departed Josh Scowen. Elsewhere, the injured Paul Hayes returned on the bench, along with Hogan Emphraim, in the match day squad for the first time since the FA Cup tie with Wimbledon on 7th December 2014 having recovered from a back injury. It was partly due to the near farcial conditions that The Shakers took the lead in 32nd minute when a low cross from the Bury right saw Alfie Mawson get in a tangle as he made four attempts to clear the ball before Danny Mayor slid in at the far post to convert. But Wanderers showed their mettle again and went close to equalising before the break through Aaron Holloway and Aaron Pierre before drawing level mid-way through the second-half. The equaliser came on 68 minutes when Marcus Bean fed Sam Wood to the left of midfield who then swept the ball into the edge of the box where Onyedinma beat off the challenge of Adam El-Abd before firing home left footed into the roof of the net from 18 yards. The home side weren't happy with the goal, claiming that Onyedinma had made an infringement (hand-ball or foul depending on what Bury official was interviewed after the game) before scoring. The protests from Bury Assistant Chris Brass were so persistent that he was eventually sent to the stands. It was then Wanderers who had the better chances to take all three points as they racked up a total of 10 shots on target, compared to Bury's 6, while the corner count was 13-3 in favour of Gareth Ainsworth side. Onyedinma had Wycombe's best chance to win the game when the ball fell to him in the box but Bury 'keeper Nick Pope gathered at his feet. Despite the draw Wanderers remain top of the division with 51 points - a point ahead of Burton who drew at Portsmouth, three points ahead of Shrewsbury who beat Hartlepool 3-0 at home. Commenting after the game, Gareth Ainsworth said, "I’m not sure the game should have gone ahead, if I’m being honest. The pitch is terrible – Bury will have their work cut out with this pitch to keep it in good nick for the rest of the season, because it was a mudbath at the end. I thought the ref would’ve called the game off. The ball wasn’t running true, there was a horrendous puddle in front of the dugouts and there were a few dodgy tackles in that area. It’s a good thing we’ve played and got a point because we don’t want to be coming up here on a Tuesday night. The pitch was the biggest factor, and knowing how to play the pitch. If I’d have put someone on today and they didn’t get up to speed with the pitch – like we didn’t in the first 15 minutes – it could have cost us. There was no way I was going to risk it when you have a point in the bag, and potentially three. It’s a tactical decision but there’s an environmental decision as well. The footwear, no matter what you’re wearing you were slipping all over the place. You had to find out which areas of the pitch were sticky and which areas the ball was running on." The Wycombe boss also revealed that the team bus had suffered a blow-out on the M6 on the way up north the previous afternoon, resulting in an extended journey time of seven hours. His team started the match slow too, with: “It didn’t go well first 20 minutes, let’s not pretend it did. We were under the cosh. They dealt with the pitch quicker than we did, but once we got to grips with it, there was only one team in it. For the last 60, 70 minutes it was only Wycombe. We deserved a draw without a shadow of a doubt and maybe we could have won it. Terrible mistake for the first goal by [Alfie Mawson] who doesn’t make many. After that he didn’t put a foot wrong, and neither did anyone else. It was one of the performances of the season."